For the past few years, the Griffin Farley Search for Beautiful Minds in New York has honoured the legacy of Griffin Farley, a strategy director at BBH New York who spent much of his career fostering planners and strategists hoping to break into the industry. After losing his battle against mesothelioma, Angela Sun and Sara Watson created the hybrid planning/strategy bootcamp and networking event. 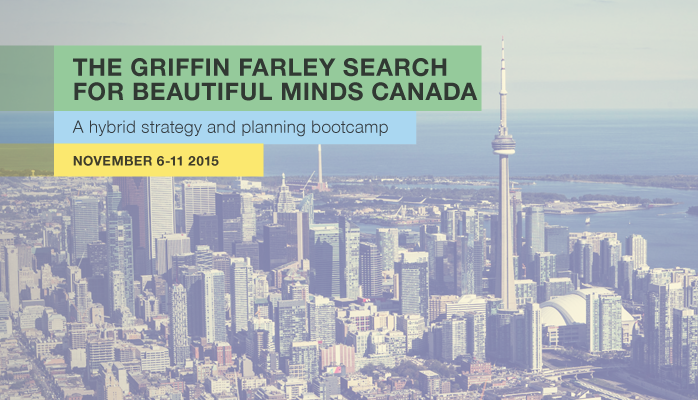 Next month, the Griffin Farley Search for Beautiful Minds is coming to Canada (GFBM Canada). Taking place on November 6-11, GFBM Canada will allow participants to participate in sessions including talks from industry leaders and practical workshops. At the same time, people will be able to compete in teams to work on a live startup client brief. Finalists will then present their strategies to a room full of marketing, innovation, and technology professionals at the showcase gala hosted by Cossette the evening of November 11. Speakers this year include Michael Halminen, head of creative at Google; Alex Peh, head of marketing and mobile at Paypal Canada; and Bill Mohri, advisor of Venture Services at MaRS. Showcase gala tickets — where attendees can look forward to a night of food, drinks, and networking at Cossette Communication in Toronto — are already on sale here.